When you think of Wyoming, do women immediately come to mind? They didn’t for me either, until recently. It turns out, Wyoming led the charge for women’s rights from early on. In fact, this contributed to why it took so long for Wyoming to become an official state. Lawmakers in Washington didn’t like that women had the right to vote in Wyoming, and demanded that they revoke women’s suffrage before the territory could be admitted to the Union. They refused, and it took them petitioning seven times before statehood was granted in 1890. I spent some time exploring these unsung Wyoming women who made history. Find out more about them and the museums and historic centers that honor their memories throughout Wyoming! Wyoming was the first territory in the free world to grant women the right to vote, a bold move in 1869. This set off a chain reaction of big moments for women in the fight for equality. In March 1870 in Laramie, the first jury in the world to include women was sworn in. This mixed jury included six women and 10 men. The women still faced setbacks not long after this achievement. Judge John Howe, who called the women on the jury, fell ill the next year and his successor did not support women serving on juries. For the women who were the first to serve on a jury, they were highly criticized by the press. It was said that these women deserted their families and that women were too emotional to serve on a jury. On the contrary, the women took their role in the courtroom very seriously and were actually praised by the judge and one of the jurors, Sarah Pease, who claimed the women were more informed of the territorial laws than the men were. Women were on juries again briefly in 1871 in Laramie and Cheyenne, and then once again in 1891 in Bonanza. After that, it was not until 1950 that women would serve on a jury again in Wyoming. The first jury to include women led to Martha Symon Boies being appointed as the first woman bailiff. The jury heard a murder case and was not able to make their final decision that day, so the jurors were put up in the Union Pacific Hotel. Martha was appointed so that she could guard the room where the women from the jury were staying. Louisa Swain, the first woman to cast a vote in a general election. Come election time in September 1870, Louisa Swain in Laramie, Wyoming became the first woman to cast a vote in a general election. Even though the nineteenth amendment would not be ratified until 50 years later, this was a monumental step for the women’s suffrage movement. Ever since she was a young woman, Esther Hobart Morris was outspoken against slavery. She grew up into a successful businesswoman, and in 1870 she was appointed as the first woman Justice of the Peace. Again, critics insisted that a woman could not hold public office without sacrificing her personal life as a wife and mother, but Esther proved them wrong. Although she was only in office for less than a year (the term she was appointed for expired), she still addressed 26 cases with grace and tenacity. The memories of these women are honored at the Wyoming House for Historic Women in downtown Laramie, along with other notable Wyoming women. Yes, this is an entire museum dedicated to women specifically and telling the stories of the women who made a powerful impact both in Wyoming and across the nation in the movement toward gender equality. The museum is located just down the block from where Louisa cast her vote and where the first women were seated on a jury. Even after these early trendsetters of the 1800s, Wyoming women continued achieving more “firsts” in the women’s suffrage movement. Lake Marie in Medicine Bow National Forest, named after Mary (Marie) Bellamy by her husband, Charles Bellamy. Mary (Marie) Bellamy was the first woman elected to the Wyoming Legislature in 1910. She was also Wyoming’s delegate at the National Suffrage Convention in Washington in 1918, through which she led the suffrage drive that eventually passed the 19th amendment to the United States Constitution that allowed women the right to vote in the rest of the nation. Wyoming elected the first woman governor in the United States, Nellie Tayloe Ross. Her husband, William Ross, was governor but passed away in October 1924. An election was held for his successor and Nellie was elected without even running a campaign. She was inaugurated in January 1925. She later became the first female director of the U.S. Mint in 1933, appointed by President Franklin D. Roosevelt. Despite her college application being rejected from the University of Wyoming and her job application being rejected for a position in Cheyenne in the local school district, Harriet Elizabeth “Liz” Byrd persisted. She was eventually hired by the Laramie County School District, becoming Wyoming’s first full time, certified black teacher. She went on to become the first black woman to serve on the Wyoming legislature (1980) and the Wyoming Senate (1989). The Ivinson Mansion, now the Laramie Plains Museum, was the home of Edward and Jane Ivinson and was built by them in 1892, about 24 years after they moved to Laramie. Both Edward and Jane played a major role in the town and were instrumental in decisions for Laramie. Jane was very involved in local women’s groups and worked to improve the cultural development of Laramie. Edward established his own mercantile and bank, and dealt in stocks and real estate. He was also very supportive of Jane and her involvement in the community, so the home now features moments when women made history as well as other historic collections. Before he died, Mr. Ivinson gave the mansion to the Episcopal Missionary District to be used as a school for girls, which it was for about 40 years. He also built a home for aged women called the Ivinson Home for Ladies that is still running today, honoring Mrs. Ivinson’s wishes to have a haven for women in Wyoming to not be indigent in their old age since the home does not charge residents to live there. In 1921 he left $100,000 to build a home for women who were in their advanced years and endowed it with $300,000 — an extravagant amount of money in those times. Mrs. Ivinson’s favorite place to have tea, set up as if she’s having company over. Once there was no longer a need for girls’ schools, the church couldn’t keep up the property. It went into ruin and the church sold off the stain glass and furnishings. It went through a whole decade of destitution and became the old haunted house of Laramie, though underneath it was still a glorious old Victorian home. Photography studio at the Ivinson Mansion, complete with examples of how you might have your photo taken and what you might use as props. Mrs. Ivinson’s sewing room that now holds bridal gowns from throughout the decades. The Laramie Plains Museum Association was formed in 1966, and one of its main members, Alice Hardie Stevens, started a rally and wrote articles for the newspaper that the Ivinson Mansion needed to be saved. The Laramie Plains Museum did take it over in 1972 when it was up for demolition, and they have been restoring it ever since. Although the items in the house are not the original ones, they still set up the house the way the Ivinsons would have had it. They tracked down one piece of the original stained glass so they were able to replicate the style and colors. See the “needle and douche” rainfall shower in the back right. Mrs. Ivinson traveled to the 1892 Columbian Exposition in Chicago so she could order everything for her new home. Seeing all of the technology at the World’s Fair, she was drawn to a “needle and douche” rainfall shower that was running beautifully when she was at sea level on Lake Michigan. There are only six of these remaining in this condition today. She had this shower shipped to her house in Laramie, at 7,200 feet altitude on the second floor in this small town and it never received enough water pressure to make it work. So it ended up becoming a wonderful conversation piece. During the girls’ school era, this room was a study hall. This table is the only piece of furniture from the Ivinson family in the museum’s possession. It was Mr. Ivinson’s boardroom table at his bank. 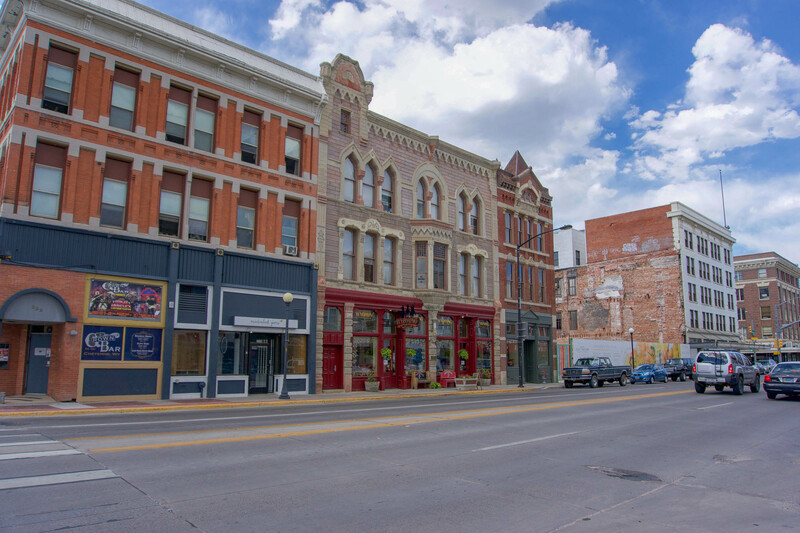 The ornate mansion is an important part of Laramie’s history and Wyoming in general. The incredible amount of thought and detail that was put into the renovations will transport you to early Laramie. Take a guided tour (required in order for you to see the property) through the mansion to step back into another era. Tours are offered Tuesday – Saturday from 9:00 to 5:00 and Sunday Afternoons 1:00 to 4:00. In the summer they are impressively led by young students who will give the tour whenever you drop by during their open hours. It may be one of the smallest museums I’ve ever visited, but the Cowgirls of the West museum in Cheyenne, Wyoming is jam packed with stories about the contributions women made to the American West and backgrounds on their lives. The museum features women such as sharpshooter Annie Oakley, compassionate mining prospector Nellie Cashman, Tad Lucas who rode bulls during World War I to raise money for the Red Cross, generous Titanic survivor Margaret (Molly) Tobin Brown, and Jeannette Rankin, the first Congresswoman in the United States during a time when most women in the country were not yet allowed to vote. I was fascinated by the inspirational lives led by each of these women and many others featured in the museum, taking on roles and earning achievements some women couldn’t even fathom at that time. Wyoming’s 150th anniversary of women’s suffrage takes place in 2019, and 2020 marks the celebration of 100 years of the 19th amendment in the United States, so these next few years are major milestones for the country and Wyoming specifically. Each of these Wyoming women and many others were essential in the fight for women’s equality in Wyoming and the broader women’s suffrage movement across the United States. We may still have a long journey ahead of us, but the legacies of these women live on today in how far we have come. Special thanks to the Wyoming Office of Tourism, who facilitated this trip! Note that this did not affect my views and all opinions are my own. As detailed in my book “Rediscovering the Ivinsons,” the Ivinson Home for Ladies was first mentioned in Ivinson’s 1916 will. That will stated that after certain gifts were made to family , friends and former employees, the bulk of Ivinson’s estate would go to build the “Ivinson Memorial Home” for “aged women.” His 1925 will retained that directive and changed the name of the future facility to “Ivinson Home for Aged Women.” Just before he died in 1928, he directed that a trust be created that would be funded by his will and would receive the all of his estate upon his death. That trust was executed on February 21, 1928. The amount of funds to be transferred was approximately $500,000. Those were the funds used to build what is now referred to as the Ivinson Home for Ladies. FWIW, there was no money given for the facility in 1921.